December is already here! We can't believe how fast 2017 has flown by! With the holiday spirit in full swing, we thought it would be fun to talk about red kitchens and cabinets! Over the last 30 years we have done tons of red cabinetry and with the popularity of painted cabinets trending so highly over the last 5 years, we have seen the good, the bad and the ugly! Before splashing a bright and bold color like red around the house, it is important to understand a little bit about the hues color theory and implications. Red is a very hot color. It’s associated with fire, passion, anger and from seasons to specific holidays. In history, red been associated with both the Devil and Cupid. Red can actually have a physical effect on people, raising blood pressure and respiration rates. It’s been shown to enhance human metabolism, too. Interesting right? That probably helps to explain why people have such a strong opinion of red. Red can be associated with anger, but is also associated with importance (think of the red carpet at awards shows and celebrity events). Red also indicates danger (the reason stop lights and signs are red, and that warning labels are often red). Outside the western world, red has different associations. For example, in China, red is the color of prosperity and happiness. It can also be used to attract good luck. In other eastern cultures, red is worn by brides on their wedding days. In design, red can be a powerful accent color. It can have an overwhelming effect if it’s used too much in designs, especially in its purest form. It’s a great color to use when power or passion want to be portrayed. Red can be very versatile, though, with brighter versions being more energetic and darker shades being more powerful and elegant. Here are some great uses of the color red that we have seen and done! One of the most common ways we see strong colors like red used is as a feature peice in the cabinetry, for instance like this island. Add some character to your room by distressing your feature island and bringing the intensity down. Don't forget that red goes with so many colors! It can pair well with other vibrant colors for a fun, quirky space or pair with with neutrals for a warm and inviting. If you are fully committed to loving red or want to create a unique, country home, go all out! Use texture and patterns to accent and create an inviting space. Have old stools that need a repaint? Try a bright bold hue! This can be an easy DIY project... and if you hate it, change it! Often an underrated way to incorporate a bold color is by getting your appliances in it. This adds a retro feel to the space. Use your backsplash as a feature space and bring in a bold brick style red. A great way to incorporate a bold color before going fully committed is with accent decor like large serving bowls, coffee containers, and hand towels! Who said the cabinetry had to be red? Try painting a single accent wall, or all the walls a bold red! Why not start small with one of the bathroom vanities? This look is pulled together with the antique mirror, chandelier sconce and vintage towels. 3 | What do you think? 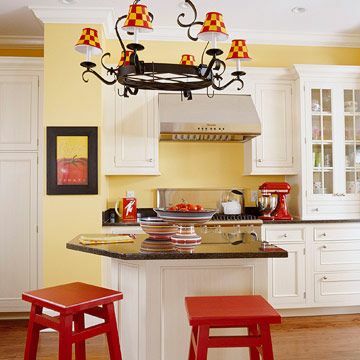 What is your opinion on red cabinetry? We would love to hear from you!